Grand National Roadster Show at Pomona, Calif. 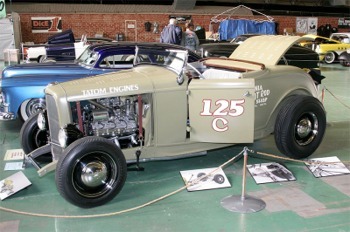 The recent 2007 Grand National Roadster Show, owned and produced by John and Annika Buck, was so lavish and jam-packed with hot rod treasures that this is the 4th article on the subject. It would be sufficient in some magazines to simply show some photos, add some captions and say, “don’t miss it next year.” But to do so would deprive the committed hot rodder of some fascinating experiences and some really far out characters. 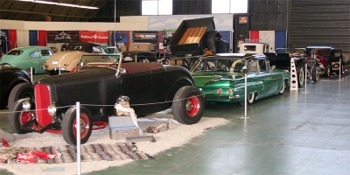 The Suede Palace was the idea of John Buck, a young man who purchased the Grand National Roadster Show and has run it for the last two years. It may be a money-making business, but he runs it like a true hot rodder. Innovation is what matters to him and it doesn’t matter where he finds it. The Suede Palace is a place for the traditional hot rodder, and if you find the terms rather slippery and changing, you are not alone. 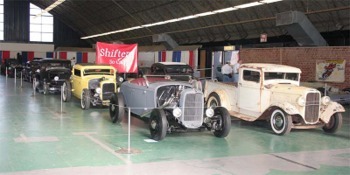 In the 6 other buildings and around the outdoor exhibits were cars that had been tenderly and loving restored beyond what Henry Ford ever did to his factory cars and trucks. You can’t fault those who put more chrome and paint on a car today than they did 50 years ago when they were penniless. We all want to make up for having to scrounge through junkyards in our youths for the parts to keep our hot rods running. The cars of today are not the cars that we had in our youth. We are cheating ourselves if we believe that they are the same cars. Traditional hot rodders are those who exist in the present but live for the past, the past that was true and pure and unsullied. The Suede Palace is a place for the traditional hot rodder, we are amazed at the ingenuity displayed by these car builders. factory chrome and paint job, but it might be slightly worn and used, as one would expect with an old hot rod that the kids from the 1950’s would build or buy from a used car lot or junkyard. After being blinded by tons of chrome, it was pleasant to go and visit with the traditional hot rodders. There are two arguments in hot rodding; 1) money drives innovation, and 2) money follows innovation. Take your pick, because there are some great young minds creating million dollar cars as well as great young minds building traditional hot rods with very little capital. At the entrance of the Suede Palace is Ian Roussel’s Dragula, a ’31 Ford tractor with a truck body, and a grill that looks like dragon’s teeth. 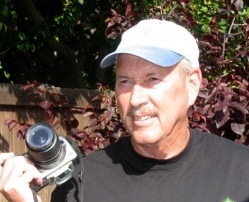 Eric “Rick” Rickman, the Baron of all racing photographers, and one of the first Hot Rod Magazine employees had his camera ready and was still ready to shoot photos well into his eighties. He told me he is amazed at the ingenuity displayed by these young car builders. Rickman just returned from Rick Perry’s Auto Show at the Cow Palace in San Francisco, California. Jerry Araujo brought his ’40 Ford 2-door sedan to the show. The car showed the proper rust spots, bondo, raw weld beads, worn black leather seats, and a cool Navajo blanket. 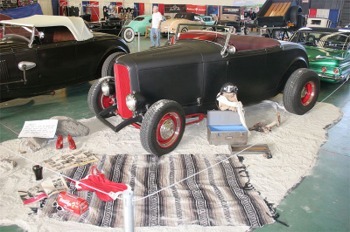 Eric Barajas from Chula Vista, California exhibited his ’32 Ford roadster that had only slight wear and tear, with black primered paint and a nice Navajo blanket over the seats. Inside the building I met Tick One, a silk screen artist who told me, “I am the rat rod scene, quote me all day if you like.” I asked him why the general public doesn’t see more of these shows and he said, “We’re on the internet and if you can’t use a computer you won’t know the traditional rodders are.” Tick told me that “rat rodders just throw junk together, but a traditional hot rodder puts quality and imagination into his work.” The Shifters Club was in charge of the Suede Palace and they did a great job of organizing the displays and the vendors who lined all four walls with booths and stalls. Skratch introduced himself and added; “last year people didn’t know what to think of us.” Skratch is from the San Fernando Valley and is a full time artist and car builder. His website is skratchsgarage.net. Robbie “El Jefe” is a promoter of these types of shows. D.J. Flat Top hails from La Habra, California and was in charge of the music for the event. He worked the Mooneyes Christmas Party at Irwindale Speedway in December, a show that surprised everybody by its success. Flat Top favors the ‘50’s Rockabilly and country tunes, and there was plenty of hip swaying, toe-tapping music while we were there. “We had to turn cars away,” he said. Flat Top told me that Alex “Axle” Idzardi is the leader of the Shifters and the man responsible for organizing the Suede Palace displays. Dave Lukkari came from Apple Valley, California to display a ’71 BSA/Harley-Davidson motorcycle with slightly faded chrome and simple custom lines. Lukkari is also known for custom bikes of high-end value. Dan and Leslie Marley, of Fairfield, California displayed their ’25 Ford C-Cab Delivery. Called Reapers Ride, it resembles a shortened hearse, or the Munsters car, and has flames flickering in the rear. The car was built by Kustom Koffins with the keg gas tank in the front much like the old fuel drag altereds, and headers that come straight up like organ pipes with stops on the top that must allow for a ghastly goblin noise and skull headlamps. Danny and Annette Galvez and their partner, Robert Conchas, created the ‘Wanted Wear’ clothing line. Danny is a pinstriper and sign painter and started his business just a month ago. “Our clothes appeal to everyone from bikers, hot rodders, hot chicks, and for the 4x tall big guy,” he said. Three lovely ladies dressed to kill in the 1950’s Rockabilly fashions with Capri pants, bangs, red-red lips and smiles that never seemed to end, welcomed us to Bombshell ‘N’ Ink, where owner Mark Glass from Orange, California sold pin-up calendars and Rockabilly flash clothing. He has owned the business for 4 years and also does screen-printing and builds his own cars. “The Kustom Kulture crowd is huge,” he said, “and some of the art work is a little risqu�.” It seemed harmless and fun as far as the crowds were concerned as they asked Julie Marlene, Cece Larue and Jay De Vil to pose with them, although a few of the older men laughed and said, “if my wife sees those photos I’m a goner.” Mark also attends the Viva Las Vegas and Blessing of the Cars car shows. Russ and Patty O’Daly came by to say hello. Russ is a member of the SCTA’s Gear Grinders Club and a top motorcycle official on the dry lakes and Bonneville and says they are looking forward to a good racing season. Carla Hernandez was all alone in her booth, selling her new brand of men and boy’s clothing with the catchy title Papi Chulos. She has the look of the ‘50’s with the smile, charm and savvy of a smart businesswoman. Carla is an eighth grade math schoolteacher with a love for hotrodding. She was voted Southern California Teacher of the year for 2006-7, and wants to become a successful entrepreneur and a stay at home mom to her ten month old daughter Elee. She loves the hot rod culture and has 6 period cars. All of these men and women live the hot rod life style, and Ian Roussel exemplifies it best. 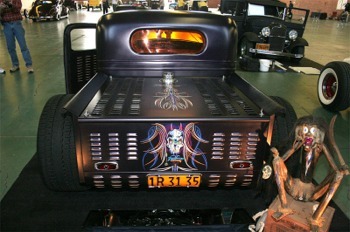 Roussel is the owner of Way Kustom Metal Works, located in Sun Valley, California. He left Ossining, New York, or “the home of Sing Sing prison” as he calls it, to come to California to build cars and own his own business. The love of his life is Stephanie Baltierra, who models his line of clothes and who was profiled in last year’s article on the Suede Palace. “I offer clothing for both men and women that’s edgy,” he said. Ian is irrepressible in his enthusiasm. He lives on a large lot, between two freeways in his shop, and his dream of building cars and living the lifestyle is coming true. “I sell T-shirts to live,” he says, and it looks like he is quite successful judging by the crowds at his booth. Model Jennie Strait was posing in a roadster, sitting so still that the crowds went up to see if she was a manikin. This is her first Rockabilly type show and she was still getting used to it. “I usually do beach modeling, but this is fun to dress up like this,” she said. Her boss was Ernie Fogg at Full Throttle Video, which is owned by Jeff Grubert of Laguna Beach, California. I interviewed Grubert last year and it looks like Full Throttle has grown since then. They produce all kinds of videos on hot rods, rat rods, Kustom Kulture, motorcycles, lowriders and Road Rage. I asked him about the Road Rage videos. “Oh, those are about extreme motorcycles stunts and jumps,” he said, “and quite popular.” Ernie lent me a copy of their new video to review called Shake, Rattle and Roll; Hot Rods, Rat Rods & Kustom Kulture, and the jacket looks hot. Another man that lives his dream is Frankie B who owns Greaser’s Alley, creating his own brand of clothing and touring the country in a ’49 Cadillac, towing his merchandise trailer. “I go to about 20 events a year and got into this business when I didn’t see anything that represented the hot rodding scene,” he said. Frankie still must work a day job but feels that his apparel for men will reach the greaser and lead sled car culture crowd. He is also a pinstriper. He shares his booth with David Lopez who is a fine artist who casts works of metal art. Edgar Hernandez and Jack Fields of Torrance, California are partners in Starlite Rod and Customs. They build and fabricate cars and have an apparel line of shirts for men. Rod & Kulture Illustrated is a quarterly magazine produced by Stevens Publishing. Stevens Publishing is owned by Roger ‘Pops’ Stevens and his son Scott ‘Zombie’ Stevens, with Lou Leto. “We’re real passionate about this magazine,” said Pops. “We print over 60,000 magazines on a quarterly basis, and it reaches hot rodders, customs, and bikers. It has art, music, Rockabilly pin-ups in it.” Lou Leto said that the magazine is only 2 � years old and is located in Bakersfield, California. “We are the masters of our own destiny,” said Leto. It has a retro look, on glossy paper, with some cool Kustom photos. A mother and daughter business with the catchy title of ‘Crybaby Blues’ caught our attention. Sheila Boyd and Erin Lancaster hail from Van Nuys, California and have been in business only one year. Like so many other women, they attended car shows with their husbands and boyfriends but did not see anything that suited them, so they created their own designs and business. Sheila and Erin go to about 25 car shows a year and sell their own clothing and other women’s and children’s wear. They have a unique style that comes closest to Rockabilly and hot rod culture. Sheila hand paints Christmas ornaments to add variety. “We are very successful with male shoppers who buy something for their wives, so that the wives will let their husbands go back to more car shows,” said Sheila. Jason ‘Rothod’ Anderson, Bridget Anderson and Kent Reppert own VictoryJaneUsa, and come from Thousand Oaks, California. They have apparel, pinstriping and art work. 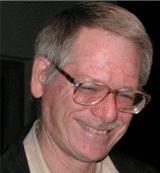 Kent is an artist and does pencil sketches and digital artwork. His art runs from $200 to $5000, and has appeared in Savage Magazine, Old School Rod, and Easy Rider Magazine. Reppert’s framed prints go for $95 and have a Ed “Big Daddy” Roth ‘Rat Fink’ look to them. A catchy name in the Suede Palace was MyBabyJo, owned by Darla Montoya of West Los Angeles who started her business in 2000. Darla not only has a retro shop but her home is a museum to the 1950’s, with furniture to match. She liked to wear flowers in her hair but it became very expensive and so she began to make her own brand of hair flowers. Her significant other is Isaiah and he began to do artwork and designs, which led to a growing business. Isaiah sells hats; fedoras, pork pies and straw hats. A very stylish dresser, he said that he loves hats and they do make the man in his opinion. I spoke to his son, also named Isaiah, who showed me some very ‘50’s fashions. “We have coats, hats, T-shirts, varsity jackets, caps, and clothing that fits the Rockabilly style,” said the younger Isaiah. Traditional hot rodders Bo Huff and Todd Gold were dressed in the ‘50’s fashion and so I asked them if this was also similar to the lowrider way of life. This offended them, “just because we’re Hispanic doesn’t mean that we all have to be lowriders,” said Huff, Gold and Isaiah the older. They’re right of course; there was plenty of variety to be found at the Suede Palace. Rob Villarreal owns Robs Chop Shop in Dallas, Texas and he was sharing the booth with Isaiah and his hats. Rob is a barber and makes his own brand of pomade that is popular with the Rockabilly crowd. He travels to Europe and around America doing shows and spreading our unique culture to the world. “The Europeans just love everything American,” he told me. Tony Colombini was there with his Blacktop Magazine. It is an on-line magazine that he started only a month before the show, and he hopes to make it a print magazine. “I’m directing it at the Kustoms, hot rod and Rockabilly culture,” he told me. was time to leave the Suede Palace and the men and women who dream of becoming the next successful Rockabilly entrepreneur. Their enthusiasm for 1950’s America is infectious and charming. I passed by the table where Candy Clark and Bo Hopkins were signing autographs. Bo and Candy were featured stars in American Graffiti, the classic hot rod and teenage coming of age movie. Both are so sweet and they treat each autograph seeker as if they were some close and dear friend, though I doubt they knew us. Candy will always remain a heartthrob and movie queen to our generation, but I was tongue-tied and blurted out “thank you Cindy,” and she gently corrected me and said, “you’re thinking of Cindy Williams from Laverne and Shirley, and I’m Candy Clark from American Graffiti.” I knew who she was, but there I was, a fifteen year old boy all over again, clumsy as ever. Curt Rigney, Roger Rohrdanz and Curt Patterson were busy sampling some of the Fairplex food. Rigney is the Advertising Director for DRIVE Magazine, which prints over 133,000 copies a month in a flashy, color-laden extravaganza of hot rodding news, articles, schedules and ads. Patterson is the Advertising Director for Legendary Ford Magazine, and Roger Rohrdanz is a photographer who specializes in drag racing and car cruises and knows everyone on the West Coast, judging by those who stopped by to say hello. The streets surrounding the buildings were full of gorgeous show cars that came for the Saturday cruise-in. Come for the day, show your car, get to park up real close and save the steep parking fees charged by the Fairplex, and you get a discounted display fee. Shelbey Valdez comes from Riverside, California and she helps her father, Von Hot Rod in his clothing store. Shelbey actually helped start Von Hot Rod Clothing and designed some of the clothes. She has been working in the booth for the last three years and goes to twenty-five shows a year with her father. What is remarkable is that she is only a sophomore in high school and is already a savvy businesswoman. “We have a line of clothing for women called Hot Rod Girl, and we sell pants, purses, blue jeans, jackets, belts, T-shirts, tank tops and children’s wear,” she told me. Then Shelbey added, “women’s wear sell faster than the men’s line, and men buy a lot for their wives.” Karen and Maynard Albertson from Lower Lake, California were in building 4 with their 1930 Ford Sedan. 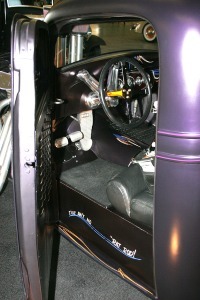 The car is an altered street sedan without fenders. It has a jet-black exterior, orange stripe and wheels, and an open retractable top. Jason Albert, one of the best car designers in America, built the car at Konocti Motors in Northern California. Albert seems very young, but he has spent 15 years building cars, and has worked in the off-road industry. 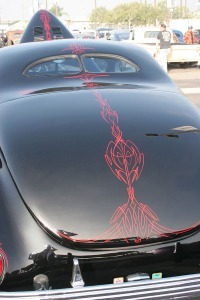 The paint and bodywork was done by A. J. Knernschield and Herb Martinez did the striping. The seats sit on a gently sloping floor and are separated from the backrests, which seem to come out of nowhere. The radiator is in the rear cooled by three 16-inch fans. Water is pumped through the cars tube chassis to cool the engine. The car won the Rick Dore Award for engineering excellence at the 2007 San Francisco Auto Show. Albert never ceases to amaze his fans with his imagination and engineering. Julie Hisel greeted us as we entered the Wally Parks NHRA Motorsports Museum. Julie, Sheri Watson, Wayne Phillips, Greg Sharp and Tony Thacker are the ones that keep this fine racing museum open to the public. Julie comes from Ontario, California and has a line of clothing, which she sells at the museum and other venues. She opened her Digger Diva line in 2005 on a dare from John Ewald. Julie was sitting in John’s nostalgic dragster and as she got out of the car she told John, “now I’m a Digger Diva.” John liked the name so much that he told Julie “you ought to make some shirts with that name on them.” She makes her own designs “for the more conservative women with more mature tastes, who don’t like to wear men’s shirts or skimpy outfits that bare the midriff.” Julie said that sales are doing well and meeting a need with women who follow racing and want to be well dressed but not flashy. She just introduced Nitro Diva last year, which caters to women who like the Funny Car crowd. Digger Diva appeals to those who like the nostalgia fuel dragsters. She is going to bring out a new line this year called Nitro Brats for children and young adults. “I got tired of seeing just men’s T-shirts and the only apparel for women were made for 16 year old girls who wore them tight and showed their navels,” said Hisel. “More women are interested in drag racing today than ever before and it’s time to dress them in more than a man’s T-shirt,” and she made her point emphatically. Her line of clothing can be found at John Force’s Racestation and on-line website and at the Wally Parks NHRA Motorsports Museum gift shop. As we left we waved goodbye to old friend John Duran, a Cal-Rod Car Club member who patiently and cheerfully handles problems in the parking lot. Our day was done, and what a wonderfully hot rodding day it was. 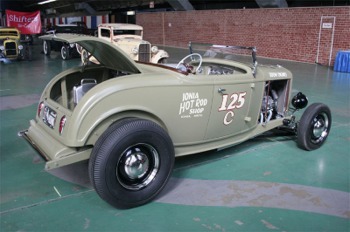 Geoffrey Skene from Jackson, Wyoming owns this very clean “Ionia Hot Rod Shop” ’32 Ford Roadster. 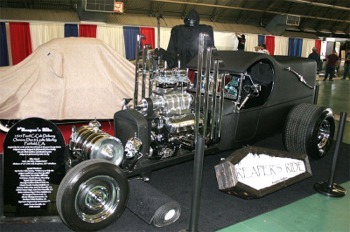 – From Fairfield, CA, Dan & Leslie Markley brought “Reapers Ride” a ’25 Ford C-Cab powered by a blown 468 inch Chevy. The exhaust notes are produced through those “pipe organ” headers. 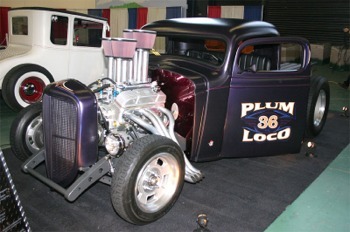 Toby & Linda Stanford of Yucca Valley, CA own “Plum Loco” a 6 1/2” channeled ’36 Ford Pickup, powered by a 383 Chevy with spectacular injection. The pin striping and louvers are awesome. 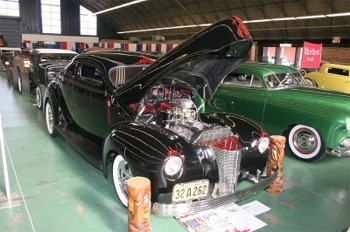 David Stinson of Redlands, CA says this is a ’40 Barris Custom Coupe. The red pin striping runs from nose to tail and looks great. Nice “Day at Beach” display for this ’32 Ford High Boy.